a tireless electronic eye monitors the track. Thanks to this technological innovation, training sessions on the track are extremely safe. 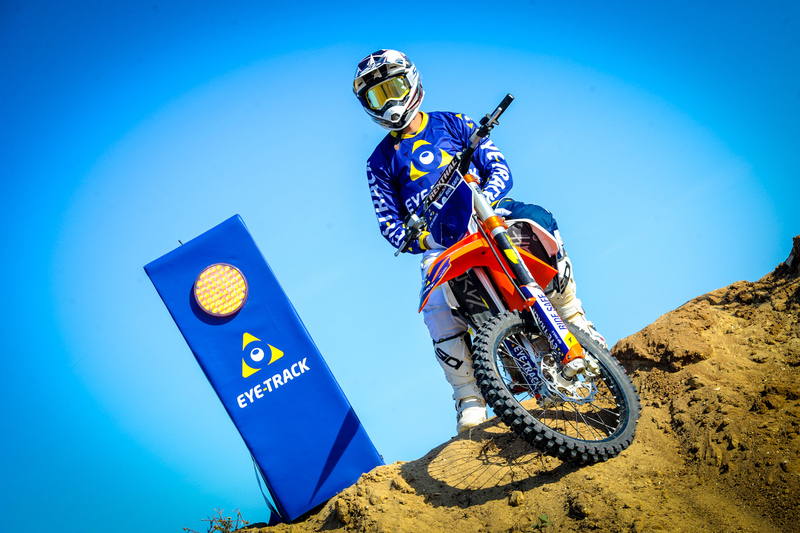 Now there is EYE-TRACK, the electronic safety system for motocross tracks (and any other type of track) that monitors every blind spot on the track just like a track marshal, every day, at any time, without distraction and at a cheaper price. WHAT HAPPENS IF A RIDER STOPs after a jump? These are the accidents that motocross riders and track managers are most scared of, and they can be avoided. EYE-TRACK monitors the track and if someone falls down, temporarily stops or crosses the track and then stops at a blind spot, an intense flashing light is switched on to warn incoming riders and to allow them to safely slow down and provide help. The EYE-TRACK electronic safety system can be installed on every track; it monitors all riders during training sessions. Riders do not have to buy or install any device on their motorbike: all they have to do is ride and train safely. EYE-TRACK operates thanks to sensors that are installed along the track, together with a flashing light placed before a blind spot to alert oncoming riders, and an alarm to alert the track manager too. If a 220V power grid is not available, it can also be powered by batteries or solar energy. Not only does EYE-TRACK work actively for your safety, all components also have added protection made of expanded polyethylene, covered in PVC. If a rider loses control of their motorbike, the EYE-TRACK components act as passive protection and absorb the shock. Made in Italy with expertise and high-quality electronics, EYE-TRACK is as accurate as a human operator, in all circumstances: heat, cold, sunlight, and darkness. The eye-track sensor detects a rider up to 60 meters away in 95% of cases. In addition to this, EYE-TRACK never gets tired or distracted. The flashing light is clearly visible, and is available as a yellow or red light. We also wanted to add an alarm, to make sure that the warning could reach riders, people at the track entrance, and the track manager (who has a specific surveillance TV screen). A smartphone app is also available for the track manager, so that they can monitor the system wherever they are and view the images and the videos of every warning. The EYE-TRACK Service Centre monitors all sensors in real time, to ensure that they work perfectly and, if necessary, to perform maintenance works. The Service Centre informs the track manager of all possible dangerous situations. The Service Centre allows the EYE-TRACK app to work: the track manager can see the images of all areas of the track, receive the alarm warnings in real time and monitor the entire system. We created the electronic safety system to replace the track marshal during training sessions. Our engineers designed EYE-TRACK so well that it is as precise as the best human operator but much cheaper and, besides that, always available. The FMI (‘Federazione Motociclistica Italiana’) regulation concerning the homologation of sports facilities (‘Normativa Omologazione Impianti Sportivi’) states that the presence of track marshals or electronic surveillance systems should be guaranteed, including during training sessions. EYE-TRACK is the best option; not only does it automatically detect if a rider has fallen down, but it also shows you – on a smartphone, tablet or TV screen – the images of the track in real time and videos of each dangerous incident that has occurred. EYE-TRACK SHOWS YOU THE TRACK ON A SMARTPHONE, A TABLET OR A 50″ SCREEN. In addition to a sophisticated system allowing you to automatically monitor riders who have stopped due to dangerous situations, EYE-TRACK provides you with a state-of-the-art surveillance system. THE TRACK MANAGER CAN SWITCH THE FLASHING LIGHT ON. The track manager can use a manual system allowing them to switch flashing lights on, as stated in the FMI regulation.